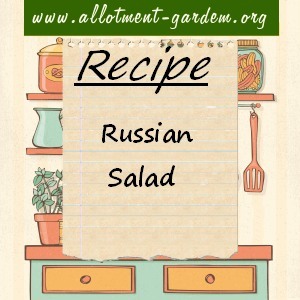 A side salad with a Russian twist. Wash lettuce and shake leaves dry. Arrange in a salad bowl. Cut potatoes and carrots into cubes and put into large bowl. Add peas and beans to the bowl and mix well. Combine with the mayonnaise – adding enough to coat the vegetables fairly thickly. Pile on top of the lettuce and garnish with wedges of hard boiled egg and slices of pickled cucumber or gherkins. Serves 4 as a side salad. Also a perfect accompaniment to any leftover roast meat.